Are today's younger listeners sorely lacking knowledge of soul music, especially the protest classics of the 1960s and '70s? 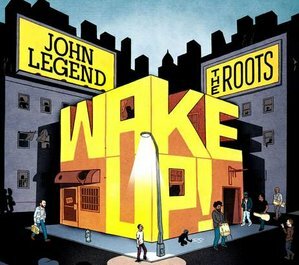 So suggests Salamishah Tillet, University of Pennsylvania assistant professor of English and Africana Studies, in her scene-setting liner notes for the vital (and in all ways Philly-connected) John Legend and the Roots collaborative project "Wake Up!" (Columbia, A-), focused on period anthems of the Civil Rights Movement and leading our new releases parade today. Drawing parallels between then and now, this funky swirl of pop, soul, jazz, hip-hop, reggae and gospel pulls you in, then hits you upside the head with freshened versions of classics like "Compared to What" and "I Wish I Knew How It Would Feel to Be Free." Also featured are lesser-known enlighteners/inspirers of the protest soul era like Marvin Gaye's "Wholy Holy" and Baby Huey and the Babysitters' "Hard Times." As Legend (known as John Stephens in his days at a Penn student) himself suggested in a news release from Columbia, "These songs sound so relevant now. On most of them you wouldn't change a lyric." Referring to the album highlight "Wake Up Everybody" (originally recorded here by Harold Melvin and the Blue Notes), Legend noted the "the first (verse) is a general statement, the second is about education, third is about health care and the fourth is about making a better environment. No editing needed." And if the rap hollers injected by the Roots' Black Thought, Common and Malik Yusef make the messages seem even angrier today, so be it, argued Ahmir "?uestlove" Thompson, drummer/musical director of the Philly-based Roots and curator of this project. "When these songs were written, people were more spiritually in tune. It was fresh from the civil rights era and there was a feeling of hope that maybe, yes, someday we will all be free. In 2010, not so much." CAUSE OR PAUSE? Do we need constant reminders that things are bad? Or should we also be seeking relief from the stress and strain? Lord knows, Michael Franti has done his share of grousing through the years, fronting the hip-hop-, soul- and reggae-toned, globally conscious bands Beatnigs, Disposable Heroes of Hiphoprisy and Spearhead. But his latest set with the latter, "The Sound of Sunshine" (Capitol, B) is as mellow and apolitical as she goes. Think perky, Caribbean-flavored, you've-got-a-friend-in-me songs in the same vein as his "Say Hey (I Love You)," that rare Franti "hit" we've been hearing lots in beach-set films and beer commercials. Yeah, even heroes have to pay the rent. Also working the calming reggae/pop thing nicely is one Cas Haley on "Connection" (Easy Star, B-). Think a pudgy Jack Jackson fronting UB40. The lyrics aren't all that; still the guy's got a winning voice and tune sense. KNOCKING ON HEAVEN'S DOOR: Bob Marley had an inkling he was dying when he capped his final album with "Redemption Song." But did blues belter Robin Rogers know she had terminal liver cancer, as has just been revealed, when she slotted her equally harrowing, gospel-fired, living-by-the-code "What We Are Worth" as the closer for her just-out "Back in the Fire" (Blind Pig, A-) set? It is hoped many will be drawn to this flickering flame, as Rogers proves herself a wonderfully nuanced singer and composer, with entertaining changes and an equally full-bodied (organ and guitar sparked) band led by her hubby/collaborator Tony. The atypically slamming lead track of the Charlatans' "Who We Touch" (The End, B-) is a real taxer for drummer Jon Brookes. Don't know if that's what he was playing when the guy collapsed and stopped breathing on stage at Johnny Brenda's last Wednesday. A doctor in the house brought him back, and, after a local hospital stay, Jon has returned to Britain. Help pay the bills by buying this set, which flirts with a variety of U.K. styles, from Pink Floyd-like classic rock to underground dance, as produced by Youth. Recently spotted backstage with his stage impersonator in the Broadway hit "Million Dollar Quartet," Jerry Lee Lewis was not looking well. Yet on his new "Mean Old Man" (Verve, B) set, "The Killer" holds his own with an army of stars who claim the original bad boy rocker as an influence. Then again, who hasn't? Dig "Rockin My Life Away" with Kid Rock and Slash, "Dead Flowers" with Mick Jagger, "Bad Moon Rising" with John Fogerty and "Whiskey River," sipped with Willie Nelson, to name drop just a few. FUSION FUN: A lot of serious composer Steve Reich's cyclically hypnotic "math" music structures could drive ya bonkers. Not so the fascinating double feature "Double Sextet/2x5" (Nonesuch, A), which features the contemporary crossover groups Eighth Blackbird on the 2009 Pulitzer Prize-winning "Sextet" piece, and Bang on a Can working "2x5." As those titles imply, both ensembles are playing in unison with prerecorded versions of their parts to achieve Reich's trademarked resonant ringing tone qualities. And yeah, it's really rocking! Also working the jazz/rock crossover circuit with sweet success are the Bad Plus on their most varied, all-originals "Never Stop" (E1, B+) and Blue Cranes with "Observatories" (Blue Cranes, B). , scorched by the UMKC (University of Missouri Kansas City) Concert Jazz Orchestra. Watson's their conductor. Two worthy thrushes are trilling for thrills. Cabaret-pop focused Jane Monheit brings it "Home" (Emarcy, B) nicely. Denise Donatelli triumphs with a more mainstream jazz approach (with excellent arrangements by Geoffrey Keezer) "When Lights Are Low" (Savant, A-).